Airy climbing on Hamarøyskaftet. Photo: Nordland Adventures. 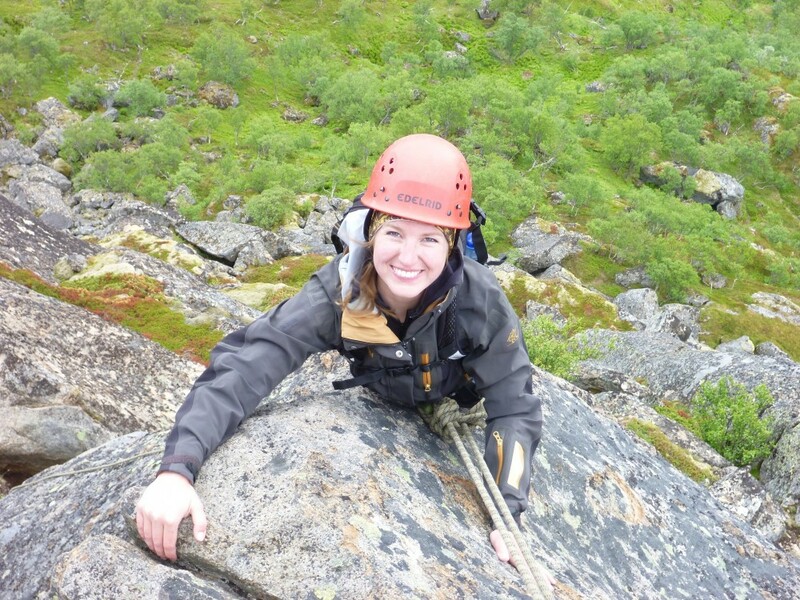 Hamarøyskaftet is not a very difficult climb, but you will still need ropes and guiding to reach the top. You must be comfortable with some airy climbing. Between the alpine sections, you will find large ledges to rest on while you enjoy the amazing views. 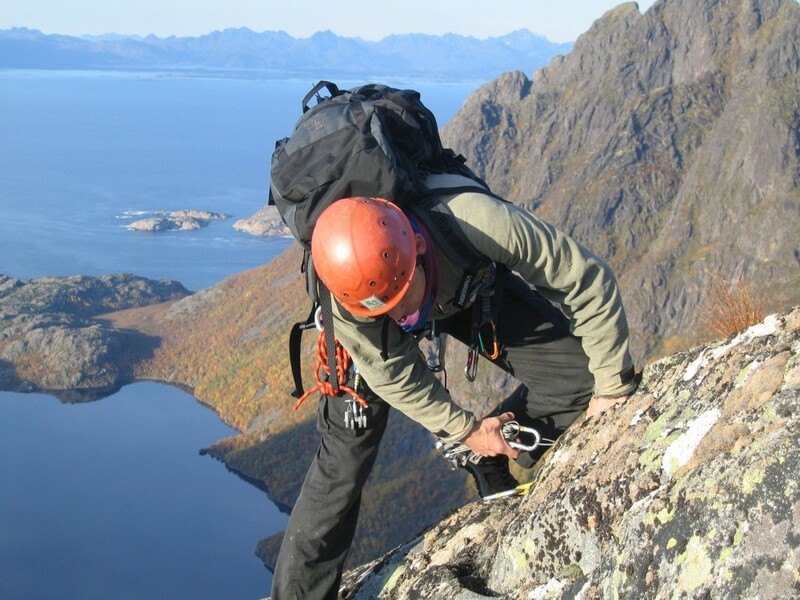 When you reach the summit, you will be rewarded with views of the Vestfjord and Lofotveggen (The Lofoten Wall) – the line of mountains on the nearby Lofoten Islands. No rush. We allow plenty of time on this excursion, so we don’t have to rush. 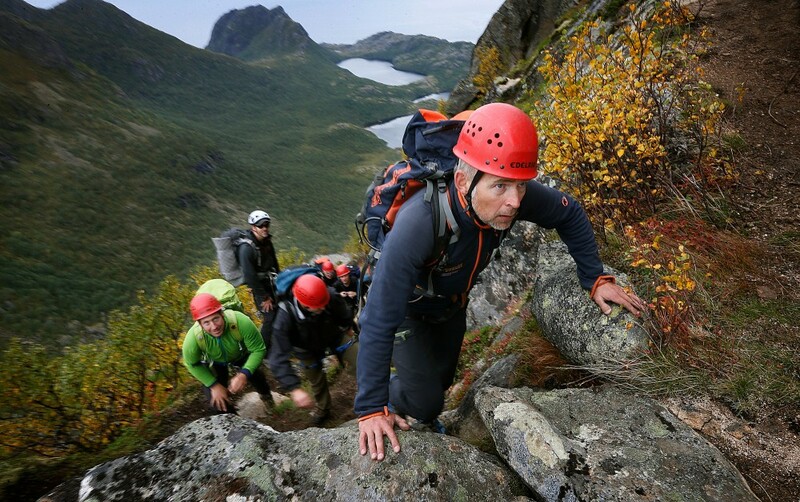 If you are wondering whether you can climb Stetind (Norway’s national mountain), climbing Hamarøyskaftet will give you a good indication of how you tackle heights. We recommend you start with Hamarøyskaftet before you decide to climb Stetind. Looks steep. Hamarøyskaftet looks steep and virtually unclimbable at first glance, but don’t be put off. Most people manage this rewarding climb just fine. 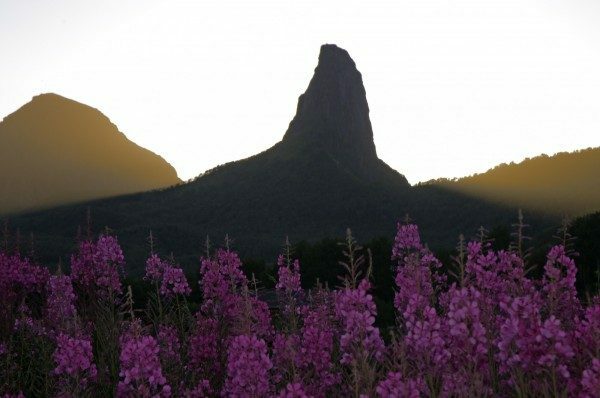 The mountain is known locally as Hamarøykuken as it resembles the male genitalia. Hamarøyskaftet is manageable for most people and on fine days you will be rewarded with wonderful views in all directions, especially the magnificence and beauty of the Lofotveggen (The Lofoten Wall). Moderate - Hard. Quite airy. Requires climbing and abseiling. Please see details below. 6 - 8 hours from meeting point. Max. 4 people per guide. We can arrange more guides if necessary. Is this trip for me? No previous climbing experience is required. You are unlikely to experience problems climbing Hamarøyskaftet if you are in good physical condition and have previous hiking experience. If you’re scared of heights, you should think twice or ask us. Grading: this trip is graded as Moderate – Blue grading. The walk to the foot of the mountain is rather easy: a good path, which takes less than an hour. The climb to the summit involves several short, airy sections, but does not involve any very difficult climbing. Between the alpine sections, you will find large ledges where you can rest, eat lunch and enjoy the view. We allow plenty of time on this excursion so there is no need to rush. Total length of this trip is 3 km (both walking and climbing included). Elevation: Starting point is 200 metres above sea level. Top of Hamarøyskaftet is 613 m a.s.l. Wind- and waterproof outer clothing and (if it’s cold) a sweater or fleece jacket, woollen underwear, hat and gloves. Hiking boots or approach shoes are fine. Preferably not ordinary training shoes because the soft sole is unsuitable for climbing. Backpack (30 – 40 litres) with some spare space for some of our climbing equipment. Food and drink. There is one place to fill your water bottle during the climb. If you have long hair, please bring a hair tie so your hair does not get caught in the abseil device during the abseiling. Please remember to cut long fingernails. Bring NOK 20 for the toll. The final part of the road is on private land. We have all necessary equipment: ropes, carabiners, climbing harnesses and helmets. When and where do I meet the guide? The meeting point is by the car park at Halsen. Please see map above. -From E6 Ulvsvåg: Drive 11 km to Oppeid, from where it is approx. 12 km in the direction of Skutvik. Turn right when you reach the sign marked Halsen og Hamarøyskaftet. Drive approx. 3 km on the gravel road, pay the toll (NOK 20) and continue to the meeting point at the car park. -From Skutvik: If you are arriving from Lofoten via the ferry from Svolvær, drive to Skutvik and continue for approx. 7 km. Turn left when you reach the sign marked Halsen og Hamarøyskaftet. Drive approx. 3 km on the gravel road, pay the toll (NOK 20) and continue to the meeting point at the car park. It’s possible to climb Hamarøyskaftet on cloudy days with light rain. However, on days with heavy rain and low cloud cover, we don’t recommend this trip. How do we arrange a date of this trip? Choose primary date or drop in. We find a primary date (excursion day) for the excursion. When we confirm this, it means you have the option of doing the excursion on that date. We go to great lengths to be flexible about date changes if the weather is unsuitable. To increase the chances of a successful climb in fine weather (so you can also enjoy the incredible view), it’s an advantage if you can arrange to stay in the area longer than just your selected primary date. Choosing a primary date is best for those who don’t live in the local area and are reliant on planning their trip here (flights, rental car and accommodation, etc.). You wait until the forecast is promising and count on us having places available. We send you an e-mail/SMS when we have places available and fine weather is forecast. Consequently, you are not guaranteed a place on a set date. This is the best alternative for those who live in the area and can travel here at short notice when it’s fine and we have space available. Why is Hamarøyskaftet our favourite? Reaching the summit of Hamarøyskaftet involves more climbing than Stetind, but is an easier trip overall. The 360-degree panoramic view from the top is one of the best we know about. 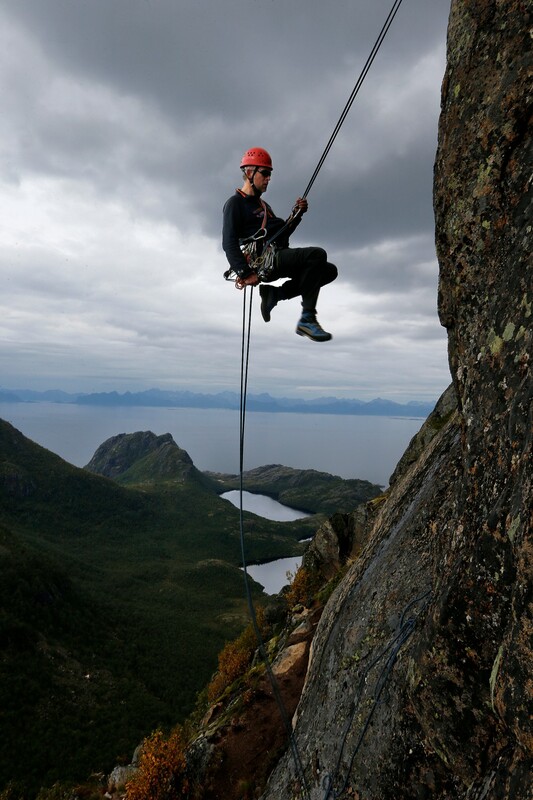 The climbing is only half the fun – the trip down from Hamarøyskaftet involves five abseiling sections. 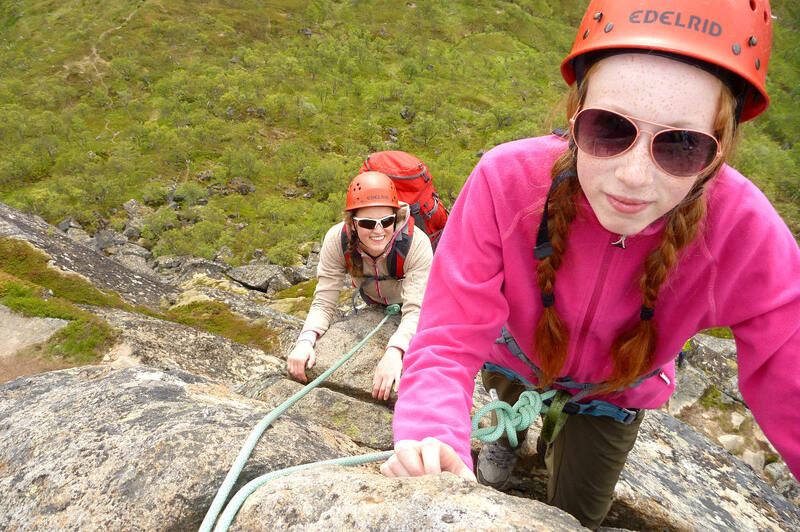 We can include some instruction about climbing, using ropes and belaying if you like. This makes the trip more enjoyable for you and your guide. There are generally far fewer people on Hamarøyskaftet than, for instance, Stetind and Svolværgeita. We like to have the mountain virtually to ourselves when we are guiding. Where to stay near Hamarøyskaftet? By the sea at Tranøy. Authentic lighthouse. Tranøy. Small hotel. Peaceful, excellent! E6 Ulvsvåg. Guesthouse, cabins, caravans and tenting. Skutvik. Camping site. Rental cabins, caravans & tenting. At Oppeid, centre of Hamarøy. 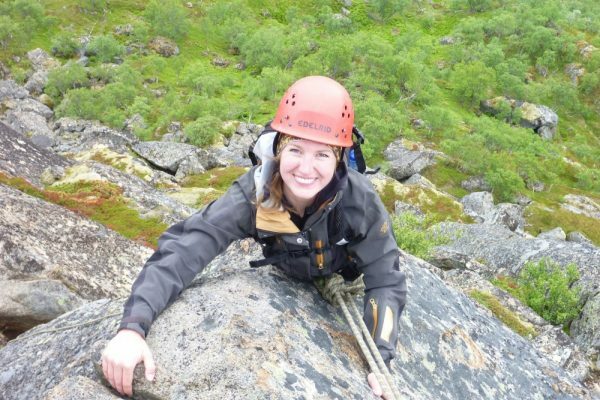 We provide safety-mined, patient and fun-filled guides who never stress to get up or down Hamarøyskaftet quickly. We only run the excursion up Hamarøyskaftet in fine weather and go to great lengths to be flexible about the choice of dates. We will gladly provide you with good advice about other wonderful adventures and places to visit in Nordland County. Just ask us! Need to know more about Hamarøyskaftet?